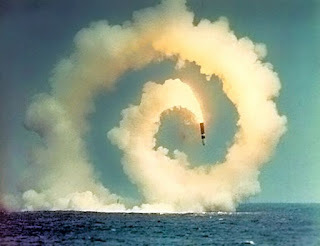 Editor's Note: Glen Milner of Ground Zero Center for Nonviolent Action has previously written about the danger inherent in the sensitive rocket fuel used in the Navy's Trident II D-5 submarine launched ballistic missile (a "design flaw"). 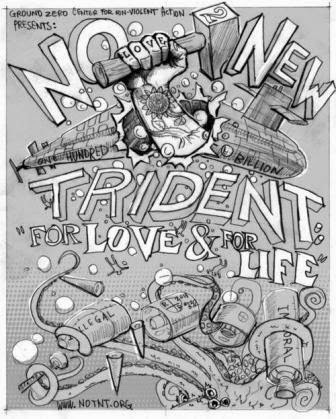 Now British whistleblower William McNeilly has leaked a top-secret manual in which the British Navy addresses the potential "accidental ignition" of the Trident rocket fuel and the disastrous consequences. If submerged... goodbye submarine and crew. If an accident occurred in port, plutonium and other radioactive substances would likely contaminate surrounding areas putting the public at great risk. On November 7, 2003 a missile handling crew preparing to unload a Trident missile from the USS Georgia accidentally left an access ladder in the missile tube when a crewmember switched on the crane, which began hoisting the missile out of the tube. The missile contacted the ladder, which punctured the nose fairing, coming within inches of the warheads and third stage rocket motor before someone noticed the error and stopped the hoist. I'll let you imagine the potential consequences had someone not stopped the hoist!!! where Trident missiles are loaded and off-loaded. Finally, I have uploaded the full statement by whistleblower William McNeilly; click here to read it. The Royal Navy's official instructions on how to take care of nuclear weapons reveal that the "chief potential hazard" from a live missile is the "accidental ignition" of solid rocket fuel. This could cause the warheads' conventional high explosives to detonate and scatter plutonium and other toxic materials "over a wide area", it says. The Trident D5 missile, used by both the UK and US, is designed with nuclear warheads closely wrapped around the third stage rocket motor. This has been highlighted as a design flaw by US experts in the past, but has not previously been acknowledged by the Ministry of Defence (MoD). The results of a rocket fuel fire at sea or on land could be "catastrophic" for submariners and the public, critics warned last night. The MoD, however, said it had to train for every scenario "no matter how extreme and unlikely". McNeilly, as well as alleging 30 Trident security and safety concerns in an 18-page dossier revealed by the Sunday Herald last weekend, says he filmed the weapons safety manual on his smartphone. Code-named CB8890, it is a book kept in a safe in the submarine missile control centre, he says. Extracts quoted by McNeilly disclose that the warheads "clustered around the third stage rocket motor are at risk from a rocket motor propellant fire". Exposed to heat, the warheads' conventional high explosives "could cook to (non-nuclear) detonation, releasing radioactive materials and aerosols over a wide area," the manual says. If warhead containment is breached, "several radioactive and/or toxic materials may be exposed to the atmosphere," it says. "These include plutonium, uranium, lithium compounds, tritium gas and beryllium. If mixed with water, fumes or toxic gases will be generated." The navy manual paints a dramatic picture of what could happen. "The chief potential hazard associated with a live missile is the accidental ignition of the first, second or third stage rocket motor propellant," it says. 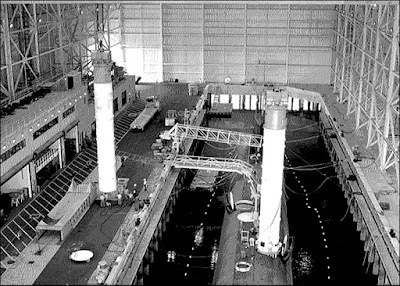 "If this were to happen in the missile tube with the muzzle hatch shut and locked, the pressure hull and bulkheads of the missile compartment would burst within a matter of seconds," it continues. "The missile contains a number of subsidiary propulsive and ordnance items that could cause damage to the missile and/or release toxic gases into the missile compartment if initiated prematurely. In some cases, this could also result in ignition or detonation of one of the rocket motors." The manual also warns that warheads could be ruptured by an accident and cause "radioactive contamination." Serious damage "could also result from a successful terrorist attack", it says. The risk of a third stage rocket fire was raised in a report on nuclear weapons safety by the eminent physicist, Sidney Drell, for a US congressional committee in 1990. More recently, it has been highlighted by Eric Schlosser, the US author of a book, Command and Control, exposing safety problems with nuclear weapons. He pointed out that Trident's solid rocket fuel was a high-energy propellant that was "relatively easy" to ignite. "The conventional explosives used in the American and British warheads designed for Trident are vulnerable to fire," he said. "The third stage of the missile - where the warheads surround the rocket motor, instead of sitting on top of it - combines both risks. A fire or explosion involving the third stage could cause the dispersal of plutonium - and perhaps a nuclear detonation with a small yield." Peter Burt from the Nuclear Information Service, which is critical of nuclear weapons, pointed out that Trident was designed 40 years ago to deliver a huge destructive force to the maximum range possible. Mounting the warheads next to a rocket motor was "a short cut which has created an inherent design flaw and drastically increased the risks from an accident involving the missile," he said. The MoD stressed that the Royal Navy had safely operated the nuclear deterrent for over 40 years without a nuclear weapons accident. "This is a safety record it is vital to maintain, which is precisely why we prepare and train for every scenario no matter how extreme and unlikely," said a spokesman. But the SNP's new defence spokesman in Westminster and MP for Argyll and Bute, Brendan O'Hara, thought that the new revelations would shock the public. "It makes for very chilling reading and reinforces just how dangerous these weapons are," he said. "It starkly lays out what could potentially happen in various scenarios all of which would be catastrophic for the crew and potentially the public, with the release of radiation." Out of sight, out of mind; until it's too late (not a good scenario no matter how you cut it). Time to revisit this issue (on our side of The Pond)!! !